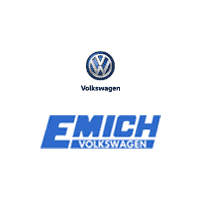 At Emich Volkswagen invDenver,vDenver we offer service you can count on for your Volkswagen vehicle! Our state-of-the-art service department is well-equipped to care for your VW. Our Volkswagen-Certified technicians know your vehicle model and are trained to keep it maintained in top running condition. Our VW techs use Genuine Volkswagen Parts that were made for your vehicle and backed by a warranty of 12 months or 12,000 miles. Use our convenient online service schedule appointment form to schedule your service appointment. Our online system will now show you pricing and availability for your vehicle! We also offer a FREE multi-point inspection to anyone who wants to learn more about their vehicle and we will provide a FREE estimate on the needed service and/or parts. Or if you want to come in for a full synthetic oil change, we charge ONLY $59.95 with the coupon printed here! Whether you need routine maintenance for your VW car or SUV or a more complicated repair, let the experts at the Emich Volkswagen Service Center take care of your servicing needs.